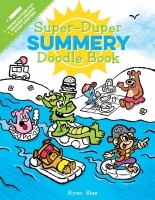 Welcome to the wacky world of the Super-Duper Summery Doodle Book! Learn to draw more than twenty funny cartoon characters in super-silly summer scenes on every page. It's clever, creative, and ton of fun! Just grab your favourite markers, crayons, or colored pencils and get set to laugh and create awesome art all summer long! Inside each book, you’ll find 96 pages of fun! Easy-to-follow drawing tips, Imaginative doodle prompts, Silly story starters, Hilarious hidden picture pages, 50 stickers! From the clever and creative mind of illustrator Ryan Sias comes a spark-the-imagination doodle and draw book brimming with cartoon characters, silly story starters, hilarious hidden pictures, and doodle prompts galore with 50 stickers just in time for summer fun!